Is your Oracle Forms Application at a crossroads? Well now it can be up in the clouds! During this webinar you will learn 4 ways your Oracle Forms application can enter the cloud world Today! Lift and shift the application to the IAAS cloud and put it onto infrastructure cloud service. Do a look and feel makeover by refacing the application using the newest Oracle Rapid Development toolset Oracle Visual Builder Cloud Service. Leverage Oracle’s newest technology – ChatBots to give Oracle Forms Applications the voice it deserves natural language! We will introduce Oracle FADS – Forms Application Deployment Services that is included in Oracle’s developer cloud service and simplifies the process of packaging, deploying, configuring, and storing archived copies of the applications. Is your Oracle Forms Application at a crossroads? Well now it can be up in the clouds! 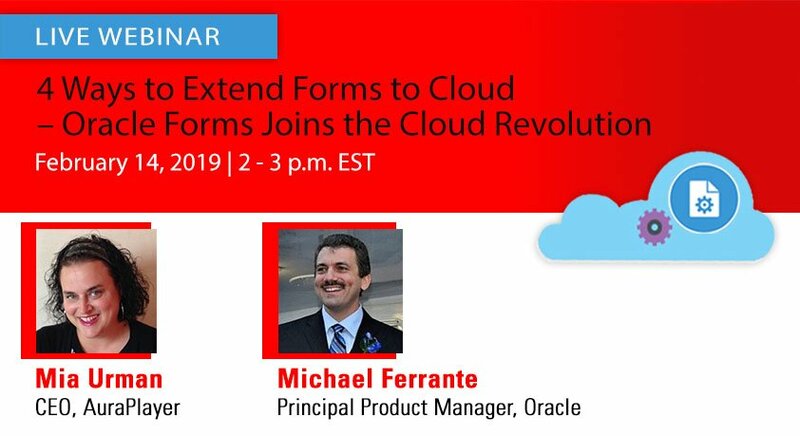 During this webinar you will learn 4 ways your Oracle Forms application can enter the cloud world Today!